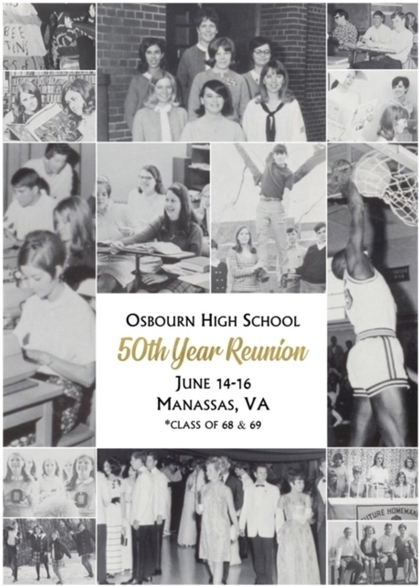 COMBINED CLASSES OF 1968 AND 1969 50TH REUNION WEBSITE! THE EVENT RESERVATION LINK IS OPEN! Please make reservations for "each event" you, plus a guest, if any, plan to attend. Reservations will not be confirmed until your check is received. *CHECKS RECEIVED WILL BE RECORDED UNDER THE "PAID ATTENDEE" TAB ABOVE. All ticket purchases must be made by check and received by May 1, 2019. Payment cannot be accepted at the events. Make your check payable to: C. Michael Wineholt, CPA. and mail to his office at: 10567 Crestwood Dr., Manassas, VA 20109. Your check will be your receipt. Again, please note in the memo section of your check how your funds are to be distributed: $$$tickets/$$$donation/or possibly, $$$ for Bull Run Winery. Around May 15, we plan to distribute to Celebration Attendees only an email list containing the contact information for all other Celebration Attendees - just so we can stay in touch. If you plan to attend, but do not wish to have your address/phone/cell shared please remove it from your profile by May 1, 2019. We will use your email address for website updates so that will need to remain in place. This website WILL serve as our only point of contact. The evening will include a cocktail hour (CASH bar), dinner and dancing. FOR DIRECTIONS: Please refer to the Portuguese Club link located on the left-hand side of this screen. DIRECTIONS: 2 Silos cannot be accessed from Rt. 28 - please refer to the "2 Silos Directions" link on the left-hand side of this screen. This is a "pay as you go event." Look for our "BLUE AND GOLD BANNER!" There is no charge to attend, however, personal donations to venues would be appreciated. Attendees will need to arrange for their transportation. Ask a friend to "double or triple" up! 10:00 AM - First stop and meeting place will be Liberia Plantation. Liberia has undergone a lot of reconstruction since most of us remember it. Please be sure to visit the Liberia Plantation website for a refresher on its history; and an update on its renovation. A lot of love and dedication has gone into restoring it. NOTE: Rather than enter from Mathis Avenue - there is a parking lot located behind the house and accessible from the Liberia Ave side. Liberia Plantation, 8601 Portner Ave., Manassas, VA. Following lunch, we will revisit our memories at Manassas High, known to us as Bennett School. THAT, thank goodness, is right where we left it! Note: there is no grill/or microwave available to heat food. To see a list of the food that can be purchased at the Winery refer to the "Bull Run Winery Info" located to the left of this screen. We suggest you bring along a carry out food order for yourself and perhaps bring an extra one to share. Any food that is carried in has to be eaten outside in the picnic area rather than inside the main building - which works perfectly - we have reserved covered spaces outside. I also understand there are usually food trucks onsite to purchase food and drinks. There is a cover charge of $15. per person to secure a private /covered space for our group. For the location of that space refer to the "Bull Run Winery Info" link located to the left of this screen. If you plan to attend this event please include the appropriate amount in your check to Mike Wineholt. Indicate "BRW $$$ in the memo section. Karen Berger Taylor has arranged a golf outing at Evergreen Country Club, on Monday, June 17, 2019. The cost is $70., includes the green fee and cart, is payable at Evergreen the day of the event. IF you ARE INTERESTED email Karen at Karentaylor214@gmail.com to let her know you're in! We are really looking forward to seeing you again! 1968: Karen Berger Taylor, Judy Hutto Quesenberry, Valerie Jones Setzer, Ed Farquhar, David Shuber, Lexi Hope. *The price to attend the smaller weekend events is separate and apart from the charge to attend the Reunion Celebration. 1. Following the Reunion please post your photos to this site so we can all share your memories. There is a link for Event photos and Celebration photos to the left of this screen. If you have any problems accessing either link please email me, Jo, right away at: Jo.M.Duke@gmail.com I will be happy to help. 2. The photos taken by our photographer, Jim Pence, will be posted to the "For Photographer" link to the left of this screen. I will send an email via this website to let you know when they become available. 3. Shortly after the Reunion all attendees should expect to receive an email from this website containing a url address. You can use that url address to download the reunion photos. Please keep your profile up to date. Thanks!